This ring is absolutely beautiful and I love it as much as my husband!!! Beautifully crafted from tungsten carbide for durable elegance, this heavyweight diamond band is both masculine and modern. The band features a row of seven diamonds, bead-set into the polished surface of the band. Lines of matte finish detailing flank the diamonds, contrasting beautifully with the polished beveled edges and completing the contemporary sophistication of this handsome ring. All weights and measurements are approximate and may vary slightly from the listed information. *T.W. (total weight) is approximate. 1/5 carat T.W. may be 0.17 to 0.23 carats. Treatment code N (diamond). See Treatment Guide for further information. Just received this product and took it to the jewelers. The diamond heat test revealed these stones are not genuine diamonds. They do conduct heat, and are certainly not plastic, but the product as advertised is false. That said, the stones look great visually along with the rest of the ring. It has a heavy weight to it as tungsten carbide should. Combined with the low price, I'd say this is still a good buy, as long as you know what you are really purchasing. Don't pass it off, or heaven forbid eventually sell it, as actual diamonds. Take pride with this ring and simply say "They are not blood diamonds." This ring is perfect for my husband. Has some diamonds but not too flash. The darker metal also looks great. He picked out the same ring at a jewelry store that was 1/4 carat diamonds and was $599. This ring is 1/5 carats but looks exactly the same and a much better price. I was super happy to find this deal!! I just received this ring today and I have to say, it is an incredible value for the amount I spent! I walked over to a major (high end) retailer in San Francisco and found a similar ring (tungsten carbide w/ .20 ct. diamonds) priced at $699.00, and the diamonds weren't set as evenly as they are in this ring. I would highly recommend purchasing this item. I noticed that several customers have experienced trouble with the ring sizing. I went to a jeweler and had my ring finger sized for the "comfort band" size and it was 7.5. I ordered the 7.5 size, and it fit perfectly (hence, I would avoid the ring sizing thing they offer on this site - have your finger sized by a jeweler before ordering). The ring has a good heavy weight and may be a bit "thick" for guys like me with smaller fingers (I personally like heavier, thicker rings though). The size of the diamonds is perfect for guys who want a classy, "understated" look at a great price. I would say, buy this ring before your size runs out! I am absolutely satisfied with my purchase. My soon to be husband was SO happy with this ring for his wedding band! This band has the perfect amount of diamonds to make it stand out, but not look feminine. I couldn't be happier, and neither could he. Do get a half size smaller than normal tho. That was good advice. We did, and it fits nicely. I was SO worried about ordering online, but we are glad we did! Same ring was over $500 at ***** Jewelers. I received this ring a gift for my husband and i was overjoyed when i opened the box. It is simply wonderful. it is so beautiful and the stones are very sparkly and very well set in the ring. i haven't given it to my husband yet but I know he will love it. it is not a light piece and it made very well and the diamonds are chancel set so they won't catch on anything. It has a brushed finish to it with the edges being very shiny. It is a comfort fit which is a must for my husband. this ring looks so much better than the picture so that picture doesn't give this ring any justice to it's quality and diamonds. the color is like a grayish or dark sliver in color. it makes this ring look even more expensive with the color it is. I love this ring and for the price I got quite a good deal. I can't wait to surprise my husband with this outstanding ring. I know he will love it as much as I do. I do recommend this ring to anyone who is looking for diamonds and beauty and all the wonderful trimming that come with this ring.It is a 8mm ring but it doesn't look that wide, but with the comfort fit it will be something i know my husband will wear with pride. My fiance and I looked at quite a few bands. I am a big fan of tungsten and titanium because of their durability. He prefers a little flash in his look (e.g.diamonds). He fell in love with this band. The product I received was exactly as decribed and is absolutely GORGEOUS! He wears a 13 normally and I did order a 121/2 due to the comfort fit. It was a perfect match and looks absolutely stunning on his hand. I cannot wait until he is able to wear it everyday. I do highly recommend this item. I did read quite a few of the reviews and understand that one customer had some issues with the band breaking. I think about it like this-nothing is 100% and the stainless steel around the diamond setting is not as durable as the tungsten. Its just a matter of being cognizant of that and not hitting the ring too hard (which really shouldn't be done anyway.) I believe it is an excellent value for the price and a beautiful ring. I am very happy with the purchase! The fact that my fiance loves it is even better! I was so happy to find this ring. We wanted to stick with Tungsten for a wedding band since it is scratch proof and my husband is very active. They bands were just so plain though. We had been looking for a tungsten ring with diamonds for quite some time but could only find them with CZ. The only ones we found with real diamonds were $$$$$$$. When I found this ring, I couldn't believe the price and I bought it right away. I was a bit skeptic about how the quality of the ring would be but was pleasantly surprised when I received the ring a few days ago. It is an amazing deal. The ring is gorgeous and looks super pricey. My husband absolutely loves it. He says its perfect because it's man and modern with the tungsten but the diamonds give it a classic touch that he loves. WE"RE VERY HAPPY! 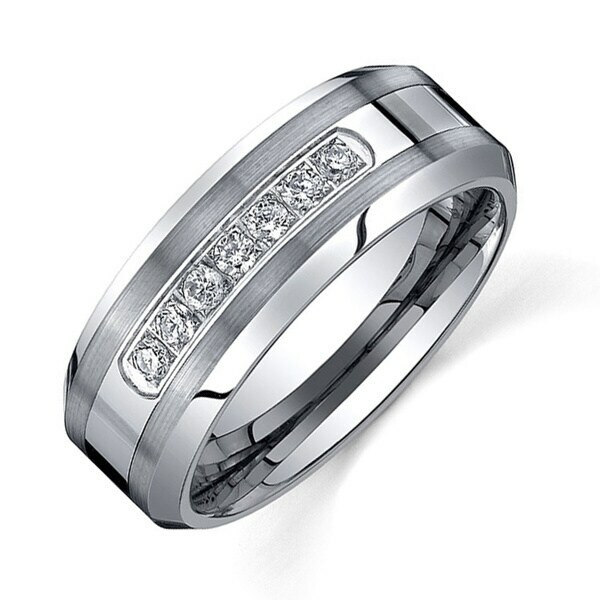 This Ever One Men's Tungsten Carbide Diamond Comfort-fit Band is gorgeous! It never looses its shine. It is made out of one of the hardest metals available. I picked this ring out @ the last minute, 2 days after my boyfriend proposed. Ordered it priority shipping as he wanted to get married @ the end of the following week. It came within 4 days and it was stunning! I couldn't have asked for a better men's band. The day we got married @ the courthouse, the Judge even made a comment "your a very lucky man!" 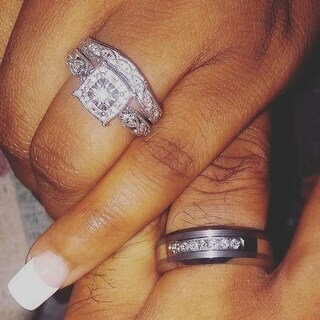 when he asked for the rings.. Thank-you Overstock.com for making everything so simple with quality products and great service. I purchased this ring for my husband as an anniversary gift and he loves it. It is very beautiful and looks expensive, but the price was just right. I have to send it back because the size was a little off. Can't wait to get it back. This ring was a Christmas gift for my husband and he loved it! I got him a size 13 1/2 and it fit him perfectly. This was my second purchase from Overstock and I've been impressed both times. The ring is the best Ive seen for a wedding band best ring for the price make sure you get it a .5 size smaller because i got it and had to send it back for the right size. Bling Bling. He was pleased, I was pleased - it's a great looking ring and a great bargain. I was not prepared for how beautiful this ring is, I was a little bit nervous about ordering it on line with out seeing it in person first. ( But it is overstock and I knew I could send it back if it wasn't right.) What can I say except WOW! It is soo much prettier in person than on the computer. It was a good choice and my husband loves it. I didn't have any problems with the sizing, it fit! He does say that it feels a little heavy on his finger, but he can live with that. Thanks o.s. This ring is amazing! My fiance loves it and it fits great. His ring size is 8.5 but that was too small so I ordered a 9 and it fit perfect. The ring is heavy and sturdy, and the diamonds are stunning. Him and I both love this ring, especially for the price I paid! This ring is better than anything you can find in the actual jewelry stores. The ring is mediocre by saved my husband friends m losing his better ring. The diamondbacks nds in the ring look really nice but I am sure the clarity is not that great as the cost is low. My husband loves the ring. It is very nice and seems well made. I just gave it too him for our anniversary so time will tell how it holds up, but we really like it and that's all that matters. 3 diamonds have come out. Excited to marry my best friend with this beautiful ring! Not so happy with the overall product.Was not happy with the finish. This is a gorgeous ring, and unfortunately had to keep returning due to the size but I would still highly recommend this product. This ring size runs large. This is our second ring like this one in two years.. BUY the Warrenty! The diamonds fall out after a year or so of wear and tear. We lost my husbands first ring to the warrenty company because it was not repairable of one small diamond. They said because of the tungsten metal. It took me many days of searching to find the same ring on Overstock. This ring is different and absolutely georgeous on my husbands hand. I can not verify if these are real diamonds as others have claimed they are not. I know they sparkle like a real diamond, and the stone accents this ring perfectly. It's beautiful, except it's slightly too big. I'm returning it for a smaller size. My husband loves it! "can this ring be sized?" "Can this ring be engraved?" "Can you please confirm that this ring is more silver in color than a darker "hematite" color? I purchase a similar ring and it was much darker when it arrived. Thank you." "How does this ring come packaged? Is it in a ring box?" "Are the diamonds real? I saw one comment saying they aren't real diamonds"
Any answer from overstock? I'm also curious because it does advertise real diamonds and is much more expensive than the rings that are cz. "Are these real diamonds? I saw a comment saying that a jeweler said they aren't real diamondss"